Attempting to treat your acid reflux with changes in your diet and lifestyle is, of course, the first and most important step you can take to control your symptoms. Some patients have gotten prescriptions from their doctors for medications, and yet, even with all these efforts they may have no choice but to undergo acid reflux surgery. What Exactly is This and What is Involved in the Procedure? First off, keep in mind that your doctor will not automatically perform acid reflux surgery without you first having made those necessary changes in your diet and lifestyle. This is because if you are causing your own acid reflux due to a poor diet and other choices, the condition is just going to return after you have the acid reflux surgery. This is not a procedure that can be done endlessly and repeatedly; it’s important to be sure that you are addressing any and all causes of acid reflux before undergoing this procedure in the first place. Also, many patients report good success with medications and prescriptions, so their continued use may forego the need for acid reflux surgery. If you have been prescribed any medications for your acid reflux, it’s important to keep up with this routine and make sure you are taking your meds properly, and do these for at least two months before you consider the acid reflux surgery. If you are neglecting your medicines and your routine, you may simply be causing your symptoms to get worse and again, the condition will just return after surgery. If you do opt for acid reflux surgery, the typical procedure is called a fundoplication. The upper part of the stomach, called the fundus, is wrapped or plicated around the lower portion of the esophagus and anchored below the diaphragm. This creates a valve in the form of a flap at the entrance of the stomach which inflates a bit as you eat and the stomach fills up; the valve is naturally tighter when the stomach is full. While this type of acid reflux surgery sounds very complicated, most patients require only an overnight stay in the hospital and of course need to stay on a soft foods diet, but typically only for around two weeks. They are usually able to return to a normal routine and diet within two to three weeks after this acid reflux surgery. Many report being very satisfied with the results of the surgery as well. There have also been many improvements made to this type of acid reflux surgery over the years. Doctors are able to perform it with a laparascope, meaning they can make several small incisions rather than one large incision along the abdomen. This makes the surgery much less invasive and cuts down on bleeding and other complications, and quickens the healing time as well. 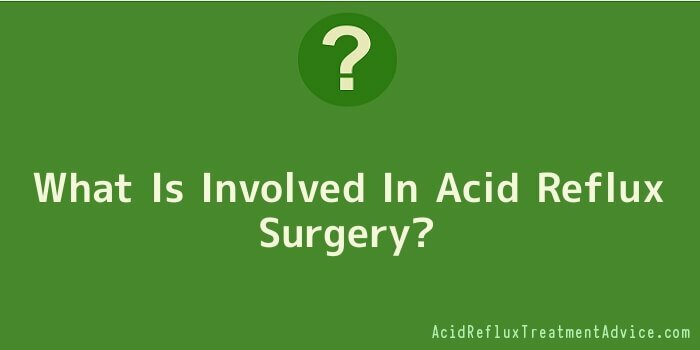 If you are considering acid reflux surgery, don’t hesitate to ask your doctors any questions you may have and then you can make an informed decision.